Our journey began in 2009. Zanna started her lessons on Tucker and was soon moved up to Scotty to learn how to post during the trot. 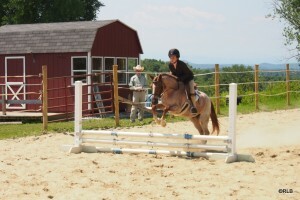 In the spring of 2010 Zanna started riding Buzz. Their connection was instant and we saw how much Zanna loved horses and riding. 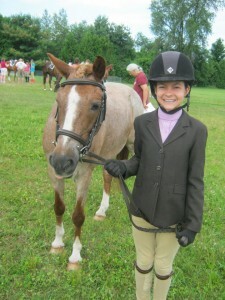 Zanna attended her first horse show that summer and trotted away with first place and second place ribbons. Soon after that we decided to lease Buzz. Their relationship continued to grow and her skills increased with every lesson and every hour that she spent in the saddle. Erin is an incredible trainer with the education and experience that we were looking for. Zanna has not only learned the basics of horse care and how to ride and show, but she has learned how to be more responsible. She has taken that responsibility home. She never hesitates to step up and help around the house. Learning to be responsible and confident was a very pleasant added bonus to riding with Erin. In August of 2010 we decided to make the commitment to Zanna and buy Buzz for her. When we told her the news she began carrying her head higher and her spirit was just lifted! She worked harder during lessons (keeping a diary at home with Erin’s comments and tips), she focused more at school and worked harder during piano and flute lessons. During show season of 2011 Zanna won 3 out of the 4 shows she attended. Coming home with 15 first place ribbons, 3 champion ribbons and 3 trophies and prizes! Her focus and determination was so inspiring, I began riding and so has my son. We love riding with Erin she is an excellent trainer who knows what she is doing and has fun doing it!